Shrimp Foil Packets are my kind of dinner. They are quick to prepare, make for super easy clean up, and not only that they taste delicious and will please grown ups and kids alike! 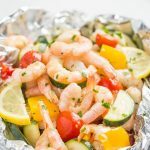 My recipe for healthy shrimp foil packets is naturally low carb, keto, paleo and whole30 so we’ve got y’all covered! I used a fresh lemon juice and garlic marinade and a selection of summer vegetables, but you can make this recipe year round and cook it either in the oven or on the grill. Start by peeling the shrimp. We left the tails on as it’s looks pretty, but it’s easier to eat if you remove them completely . Cut the zucchini into thin slices, and then cut them in half again. The cherry tomatoes should be halved too, unless they are very small and the bell pepper needs to be deseeded and cut into 1 inch squares. Tear off pieces of foil that are about 15 inches long and evenly divide the shrimp packet mixture onto the foil pieces then simply place a slice of lemon on the top and fold them into pouches (see image below) then place them all on a baking sheet and bake in the oven for about 15 – 20 minutes. Check the shrimp foil packets after 15 minutes, if the vegetables are cooked remove them and carefully open each packet. You can serve them with a little more lemon juice and a sprinkle of chopped parsley. 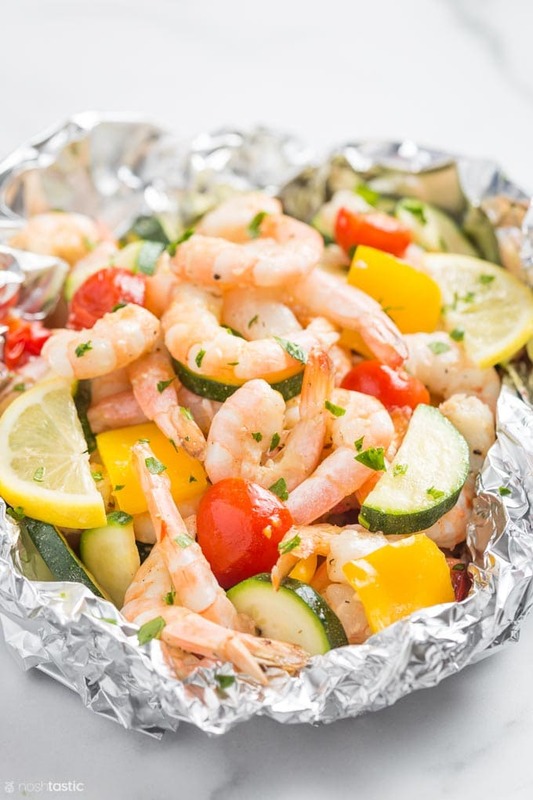 Quick, easy, healthy, these shrimp foil packets are a fun weeknight meal. 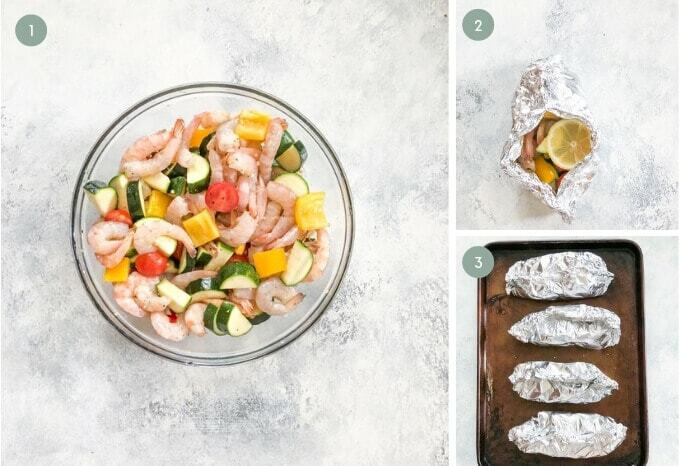 Cook the shrimp foil packets on a hot grill for about 10-15 minutes or until the vegetables are cooked through. serve hot and sprinkle with a little chopped parsley and a squeeze of lemon juice. Cut 4 large sheets of foil, about 12-15 inches long. 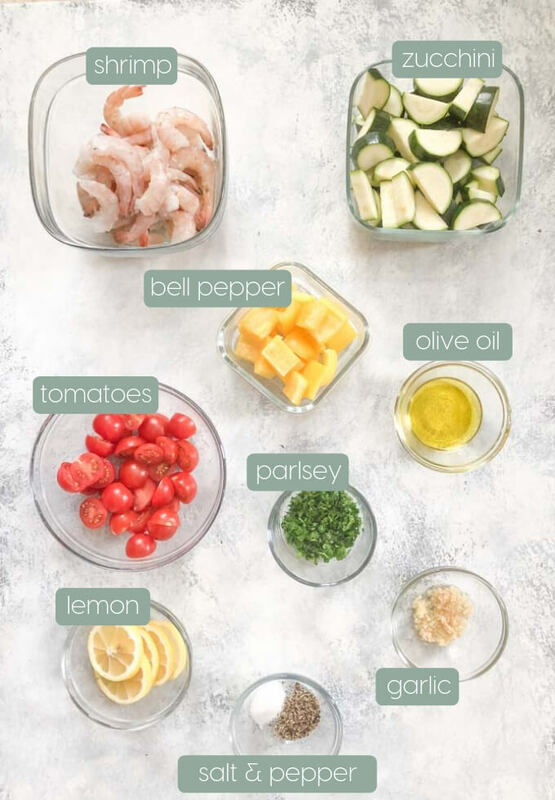 Toss the shrimp, tomatoes, and zucchini in the olive oil, garlic, salt and pepper and let sit for 15 minutes in the fridge, then stir again. 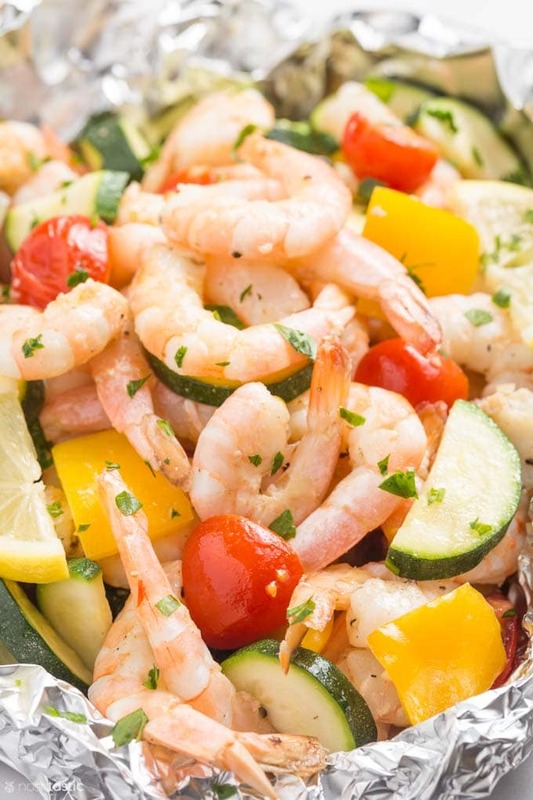 Equally divide the shrimp and vegetable mixture over the foil pieces and top with a slice of lemon. 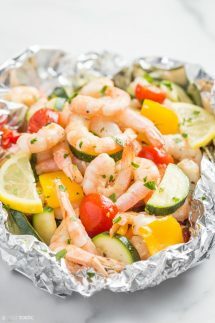 Fold the foil packets over the shrimp and vegetables to completely cover the food, then fold the top and bottom sides to close them. Bake for 15 - 20 minutes or until vegetables and shrimp are fully cooked. serve hot and sprinkle with a little chopped parsley and a squeeze of lemon juice.